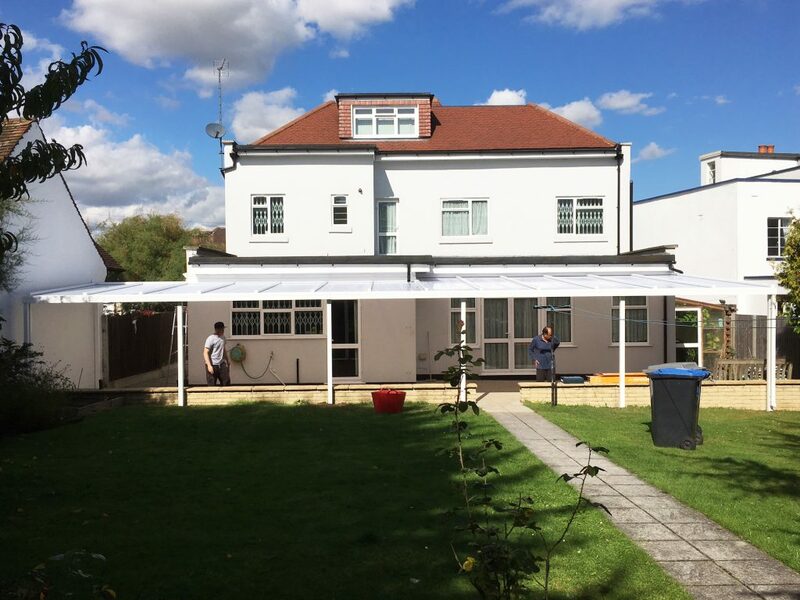 A recent Samson P35 installation at a domestic property in Greater London is a fantastic example of a veranda or roof system which has different projections throughout the span. As you can see from the pictures below, the requirement for it to run the length of the building, plus the unusual shape of the rear of the building, meant that was a necessity, and because of this it required a specially designed and constructed veranda. Because of this, the Samson P35 was the perfect choice, due to being easily fitted and having great projection capacities. Alongside this, it has an unlimited possible length, making it perfect for constructions such as this, which run all the way along the property. This particular one is 13 metres in length. The P35 is incredibly strong and has a fully aluminium frame. 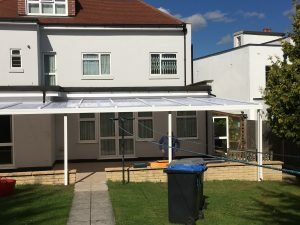 It has reinforced aluminium roof bars to help with stability, and is strong enough that the system’s roof can be walked on with the use of boards in the case of an emergency such as a fire. The system also contains 35mm shatter resistant, UV protected, seven wall poly carbonate sheets. Alongside this, the P35 is stylish as well as practical. The system can be painted any RAL or BS colour to suit your home or businesses needs and look. In this case they stuck with a standardised white paint. 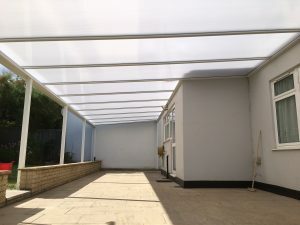 It can also be fitted with Integrated LED lighting systems as well as infrared heating systems which are available and given the UK weather are one of the most useful additions when it comes to increasing the time spent using your outdoor space.